Charlotte Project - Lose the truth and you lose the world. and you lose the world. We are bombarded daily with information through our computers, laptops, tablets and mobile phones but it is getting harder and harder to work out what you can trust and what you can’t. This is true for all of us but particularly for young people who have less life experience with which to judge things. The Charlotte Project is designed to give young people some tools to help them navigate the maze of news, blogs, social media posts and comments so that they can work out what’s real and what isn’t and give them the confidence to engage in current events. 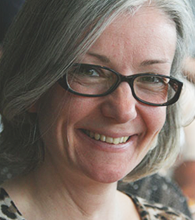 The Charlotte Project is named in memory of Charlotte Cooper (16.3.67 – 22.4.17) who was a journalist with the global news agency Thomson Reuters for 26 years. Her final role was as Learning Editor for Europe, Middle East and Africa with responsibility amongst other things, for running the graduate trainee scheme. It was a role that she loved and excelled at. Charlotte was passionate about passing on the highest ethical standards that underline the best reporting and the very best journalism. She was committed to improving diversity in the newsroom and inspiring the next generation to become the journalists of tomorrow. We had a fantastic experience at the Charlotte Project workshop we attended in April. It was a privilege to see how engaged the students were, and it was extremely valuable for us to have the opportunity to speak with them. We would definitely participate again.